Erickson’s Café, “the temple of 10,000 delights,” slaked pioneer Portland’s many mighty thirsts. August Erickson was not a man to let a little deluge slow his business. So when the Willamette River’s “Great Flood” hit Portland 120 years ago this month, Erickson moored a houseboat in the middle of W Burnside Street. Patrons rowed up in little boats, homemade rafts, and even caulked packing crates for shots of whiskey and to meet ladies. Established in the 1880s, the legendary Erickson’s occupied a block of Burnside between NW Second and Third Avenues. Erickson, a Swedish immigrant, envisioned a boozy destination to rival the fleshpots of San Francisco and great drinking halls of New York. As miners, loggers, sailors, and soldiers from Fort Vancouver streamed through his doors, legends of this giant saloon spread up and down the West Coast, and it picked up some nicknames: The Working Man’s Club. The Café. The Temple of 10,000 Delights. Indeed, Erickson’s had everything a drinking man could need: a barbershop, an orchestra, a movie theater. Patrons could rent little rooms, or “cribs,” to sleep or to conduct other nocturnal transactions. The 684-foot bar, it was said, could serve 300 men at a time, who could choose from an astonishing 50 brands of whiskey. A giant schooner of Henry Weinhard’s beer cost a nickel, while bartenders in white vests and heavy gold chains concocted higher-end cocktails. Erickson’s offered “the Dainty Lunch,” a free buffet of salty sausages, roasts, and Scandinavian cheeses—perhaps the earliest version of the now ubiquitous charcuterie plate. One trend that hasn’t caught back on: a trough that ran along the foot of the bar, so a patron need not abandon his pilsner to relieve his bladder. 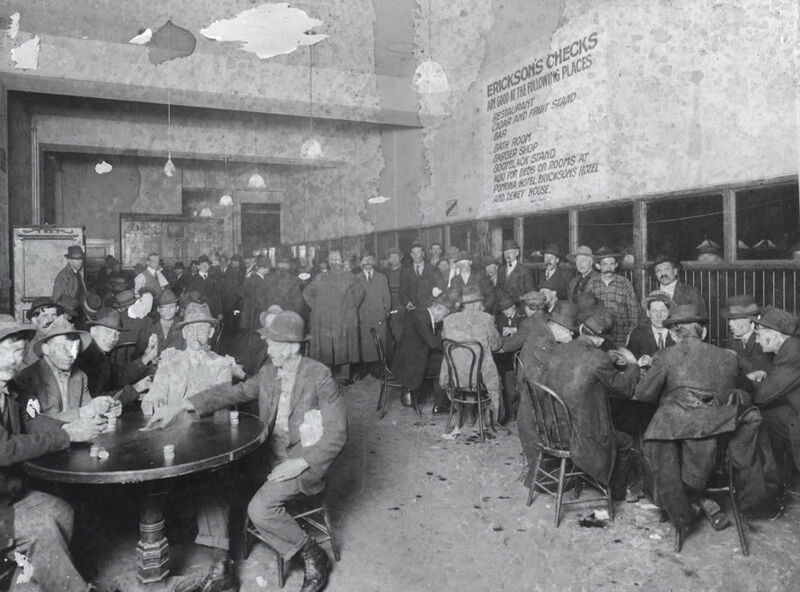 Erickson sold the bar in 1907, and Prohibition brought a disappointingly quiet end to the debauchery. The giant bar was cut up, the ornate fixtures sold off. Only tall tales survived—which will soon make room for a more respectable future. This month, Innovative Housing plans to begin transforming the former saloon building into 62 low-income housing units.